(Peromyscus polionotus phasma) Status: Endangered. 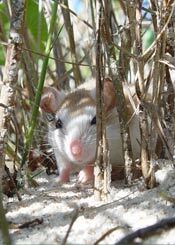 The Anastasia Island Beach Mouse is on the federal endangered species list. They live in the sand dunes of Anastasia Island and on the unnamed barrier island north of the St. Augustine Inlet at the Guana River State Park. They have a light buff colored back, pure white underparts, and indistinct, white markings on their face. The Anastasia Island Beach Mouse inhabits sand dunes where sea oats and dune panic grass grow. The area near these dunes is populated by oaks and sand pine or palmetto. They dig burrows for nesting and food storage and sometimes live in old ghost crab holes. Both of these species are primarily threatened by beach and residential development which has eliminated suitable habitat. Predators such as raccoons, skunks, snakes, great-blue herons, dogs, and cats pursue the species. Other predators include house mice and free-ranging house cats. Florida Fish and Wildlife Conservation Commission (FWC) Wildlife Alert 1 (888) 404-3922. J.B. Miller beach mice photos, Terry Doonan mouse tracks photo.